Printed by Kronheim & Co. using the Baxter Process about 1860. 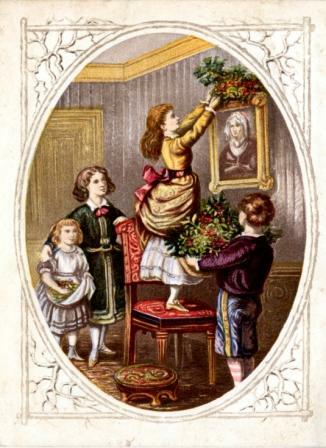 One of a set of six Christmas cards printed on one sheet by Kronheim. Of every nation under the skies. He will do you good, and will not tire. And the poor and needy to help and bless. And double-lock it on ugly sin. For 'tis always joyous where Jesus comes! The card measures 12.5 x 9 cm.